Concord, Massachusetts was the first New England community away from tidewater, and First Parish was its first church (1636). 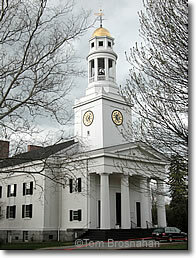 First Parish in Concord was "gathered" in 1636 in Cambridge, Massachusetts. Its first ministers, Peter Bulkeley and John Jones, were installed in 1637 in Cambridge. Between 1667 and 1673 a new, larger meetinghouse was constructed, and in 1711 this was replaced by the third building. Reverend William Emerson, grandfather of Ralph Waldo Emerson, served as minister of First Parish from 1765 to 1776. In 1774 and 1775, the Massachusetts Bay Provincial Congress convened in the First Parish meetinghouse several times, and in 1775 and 1776 it welcomed the students and faculty of Harvard College who moved from the uncertainty of wartime Cambridge to the relative safety of Concord. The third meetinghouse, more or less on the site of the present one, was renovated in 1791 and in 1841, when it was turned north to front on Lexington Road. Originally a Puritan Congregationalist congregation, First Parish evolved to Unitarianism during the 69-year pastorate of Reverend Ezra Ripley (minister 1778-1847). In 1821 a group of congregants holding to trinitarian beliefs left First Parish to found Concord's Trinitarian Congregational Church. In a spirit of harmony and concord, they were invited to meet for services in the First Parish meetinghouse until their new meetinghouse on the other side of the Mill Brook could be completed. Following the custom of the Pilgrims, First Parish in Concord was identical with the Town of Concord for organizational purposes, and town meeting was held in the First Parish meetinghouse. Taxes supported both the town and the church. This un-American unity of church and state ended in 1855-1856 when the municipal government was separated from First Parish. In a tragic fire on April 12, 1900, the meetinghouse burned to the ground, its steeple bell partially melted by the intense heat. Rebuilding began that same year, and the fourth meetinghouse, a modernized replica of the third, was finished in 1901. Since then, renovations and additions have expanded the meetinghouse and the adjoining historic Wright Tavern, owned by the parish and used for church offices and meetings. First Parish today is one of numerous religious centers in Concord, among them an Anglican church, a Unitd Church of Christ church, a Roman Catholic church, and a Jewish synagogue.